True luxury and quality of life awaits you with this one of a kind estate. The exquisite amenities and craftsman touches in this home are beyond compare. Enter through the electric gate into the porte-cochere to be greeted by your own waterfall to one side and grand staircase leading to the ten foot tall wrought iron double entry doors on the other. In this home, you’ll find rich hardwood flooring, artisan wrought iron work, travertine tile, and soaring open beamed ceilings to compliment the spaces. Stunning wood work throughout this home is the labor of a master craftsman and includes eight foot tall solid wood doors. The master suite is an oasis of its own. Towering ceilings and rough wood beams compliment a space that includes: double sided stone fireplace, kitchenette, wraparound balcony with estate views, expansive walk-in closet, and a well-appointed master bathroom. The family room includes sliding glass walls to let you embrace indoor-outdoor living. The pool area has rock formations that create a grotto for the spa and a breathtaking waterfall that fills the space with the soothing sound of running water. The grounds also include: a guest house, 5-car upper garage, 2,200 square foot rv garage with 14’ ceiling and pass-through doors, multiple lawns, stables, and a horse turnout. The neighborhood includes: riding trials, parks, dining, shopping, and award winning schools. You will know you have “arrived” in your own luxury estate in the land of gracious living. As soon as you walk through the door, this custom-built property will take your breath away. With creative details around every corner, you will need plenty of time to experience all that this home has to offer. You will be instantly transported to an aspen chalet as you find yourself surrounded by the knotty alder wood doors, cabinets and trim, which are perfectly complimented by the enormous stone fireplace and finishes in the great room. There is no compromise here; you can have luxury as well as security in this estate. Recently re-built in 2006, the new design utilizes steal beam construction, and anderson doors and windows. The owners have created a dream home with features for everyone in the family. A huge kitchen with granite counter tops, top end appliances, and a pot-faucet, as well as a home office with a fireplace of its own are spectacular…but included in this home you will also find a room already wired for a home theater, 2 tank-less water heaters, 2 separate laundry areas, and laundry shoots! Some amenities were just meant to be shared to be truly appreciated…no one will turn down an invitation when you are entertaining in your very own pub! But whether simply relaxing on your own or entertaining many, you are not restricted to the indoors! Outside you will find a 4. 5 car garage/work space, rv parking and a covered patio that features a built-in bbq which overlooks the beautiful pool and spa area. This uniquely enchanting property must be seen to be believed! 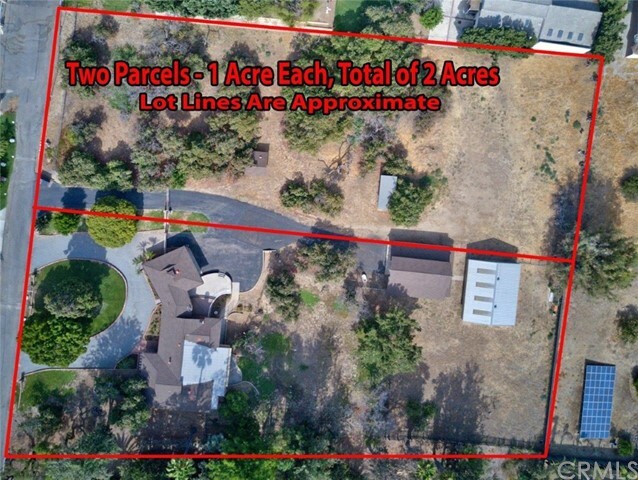 In the heart of yorba linda,2 flat usable acres is truly a rare find! Properties like this just don't usually come on the market. These 2 - 1 acre parcels have the potential of becoming the estate a discerning buyer has dreamed of. 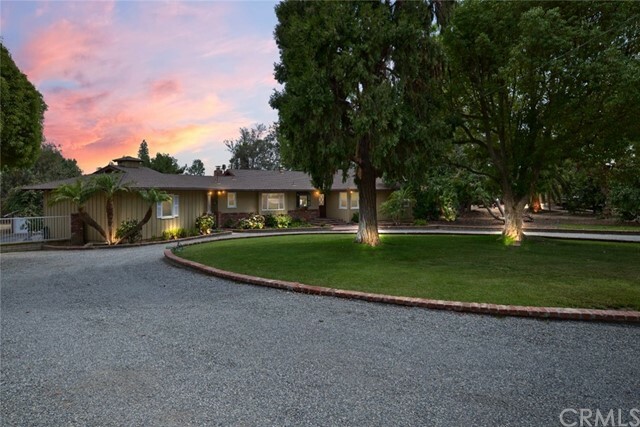 The primary lot has a lovely mid century ranch style home with over 2,000 square feet,a large barn & showroom. The second parcel has an avocado grove & citrus trees. There's even a historic building on the property from the earliest days of downtown yorba linda,that was grove keeper cottage on lakeview. This property is surrounded by an eclectic blend of multi-million dollar homes & some homes dating back to the early 1900s. A circular driveway is in front of the existing ranch house,& the home itself has a beautiful family room with wood beam ceiling & used brick fireplace & a remodeled kitchen with rich wood cabinetry,wood plank flooring & breakfast nook. There are 3 spacious bedrooms,the master with a private bath,a full bath off the hall,powder room,laundry room & living & dining rooms. A bonus room is in a basement area with access to a covered patio. When you decide to build your dream estate,the existing home is a perfect guest house. The barn & showroom are ideal for a car enthusiast,with room for 12 or more cars,and for an equine enthusiast,the property is also zoned for up to 8 horses. A developer could even build 2 stunning estates,each on 1 acre. Separate parcel #s for each lot means no need to subdivide. Don't miss this exceptional opportunity! Welcome to ashbury lane, developed to bring modern farmhouse to the land of gracious living! Ideally situated in central yorba linda, this brand-new luxury estate sits on over a flat half acre at end of a private cul-de-sac. It has everything one comes to love and expect about the highly sought-after modern farm design with sleek clean lines of contemporary design and timeless farmhouse feel. No expense was spared in creating this modern dream with finest finishes and natural textures. Every detail has been carefully selected with quality craftsmanship. Tremendous open floor plan features a spacious light-filled great room, lofty ceilings and gracious living spaces that flow seamlessly to outdoors via multi-slide glass doors. Single story living with desirable downstairs master suite boasts sleek counter tops, custom tile finishes, finished walk-in closet and french door access to backyard. Unbelievable chefs kitchen is clad with premium finishes and fixtures including shaker-style cabinetry, stainless appliances and walk-in pantry. Guest suite, private home office plus oversized laundry room on lower level. Wide plank hardwood flooring, including the staircase leading to upstairs loft, a light and bright area with custom media center. Two spacious en-suite bedrooms complete upper level. Oversized and finished garaging for 3 with rv access. Pre-wired for smart home technology, security and efficiency. Situated among great schools, restaurants and new town center. 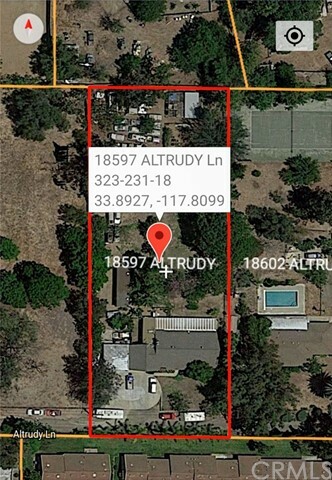 This is a very rare opportunity to own a 2 acre property a mere 300 yards from the new yorba linda town center and the soon to be developed new yorba linda library and senior center. This is a 1 acre rectangular shaped flat lot that is side by side with a second 1 acre lot, rectangular shaped and also flat land. Both lots are being sold together. Seller will not split them up. This lot is 18597 altrudy ln, the second lot is 18602 altrudy ln. Each lot currently has a single family residence on it. This listing (18597 altrudy) has a 4 bed, 2 bath, 1,645sqft single story home (currently occupied). The owner is selling this property for its land value, if the buyer chooses to clear the land removing all existing buildings, this will be done at buyers expense. No tours of the residence will be provided. Don't miss this fantastic opportunity to own a 2 acre parcel right next to the newly developed yorba linda town center and main street area. Gorgeous, one-of-a-kind custom home in the heart of yorba linda! This english country mansion has it all- oversized guest house with private entry, 6 car garage. Main house has 3 bedrooms, 3. 5 baths with oversized bonus room, pool, spa and rv parking! While impressively large, this home still has an intimately warm feel! The moment that you walk in you will be impressed with a grand staircase, high ceilings and a great view of the backyard. To the right is a spacious living room with majestic beveled windows. Continue forward and you’ll be greeted with the dreamy, remodeled kitchen with custom cabinets, granite counter tops, large pantry, thermador appliances and breakfast nook. The master retreat has it’s own balcony, fireplace, sewing or hobby room and walk in closet. Entertainers have so many options between the upstairs bonus room with a bar and fireplace or the outdoor pool, spa, built in bbq and large grassy yard. Looking for a place for your extended family to stay? The guest house has two bedrooms**one downstairs** kitchen, living room, garage access and private patio. If you like road trips or have lots of toys the 6 car garage and rv parking with dump station make river and desert trips easy and effortless. Zoned for up to 4 horses. Tucked away on a private street you can enjoy the quiet country feel yet be centrally located to dining and shopping, numerous parks and trails, close to freeways and part of the placentia yorba linda unified school district! An entertainers dream come true. This luxury home, right in the heart of beautiful yorba linda, is not to be missed. Surrounded by the prestigious lakebed nature park, with easy access to hiking and horse trails, this 3,953 sqft home has 5 spacious bedrooms (four downstairs), 5 bathrooms, living room, family room, and dining room w/fireplace. The open floorplan is well thought out and offers a natural flow throughout the house. The kitchen is beautifully appointed with stainless steel range, subzero refrigerator, dishwasher, microwave, convection oven, two sinks (one in the large island) and is open to the dining room and family room. Lavish and inviting, the master suite features two walk-in closets, large shower, dual sink vanity and a large balcony overlooking the backyard and swim spa. This home truly celebrates the gracious living lifestyle with its lush landscaping, flat 21,675 sqft. Park like settings including ample seating, bbq island, lighted dance floor and children's play area for entertaining family, guests, and friends. The large yard also features two additional buildings, one is ideal for storage, and the other is a perfect he shed/she shed. A large driveway, oversized two car garage, and gated rv parking complete this fantastic home. 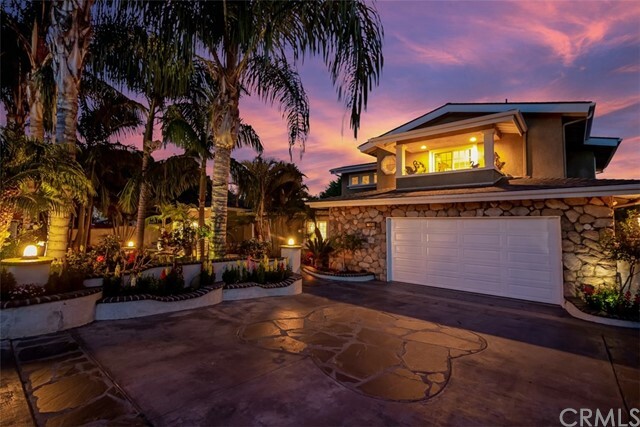 This spectacular view home is located in the hills of yorba linda! It surrounded by views of city lights, panoramic, trees and mountains!! Welcome home to this exquisite 4 br 3 ba house. This 2921 sq ft beauty is nestled in a gorgeous manicured, landscaped, and well lit, over 1 acre lot. It is laid out with a fun pool and spa in the back with your very own regulation tennis court, with all the lighting you will need to play anytime. The long wide 3 car garage driveway is lined with clean brickwork leading up to the double door entry. Upon walking through the front doorway, you will be enchanted by the high cathedral ceilings and the wonderful tile and plush carpeted flooring. This home features a comfortable formal living and dining room. It also has a newly updated kitchen with granite counter tops, which opens with a breakfast nook wrapped around leading to the dining area with beautiful views of the pool and backyard. The next room is a great family room with a colonial style brick fireplace with sliding doors leading to the shaded covered patio. The downstairs also features an office for easy access. Master room suite has walk-in closet and viewing deck. Each room shows a different personality and charm. The gated rv and boat parking space is spacious. Furthermore, it is close to san antonio park, which has playground, field, and horse riding. No mello roos& hoa dues. There are high-quality schools around you-travis ranch elementary school, middle and new yl high school.